I’ve been lucky enough to live and work in the Scottish Highlands since leaving the Lake District as a young man. The Hills and lochs, mountains and humbling scenic landscapes have demanded my attention since a youngster. I have been privileged enough to use varied outdoor leadership skills and qualifications both nationally and internationally to maximise time sharing my excitement for mountains and wild places with others. As a Mountain Bike Guide and Coach amongst other Outdoor Leadership disciplines, my passion lays in enabling others to experience, learn and develop their personal skill set. Travelling through the wondrous global mountainous environment on two wheels is my one true love and I get really excited to help others find theirs. Negotiating the granite tores of the Scottish Cairngorms, winding through & over the peaks of the North West Coast & revitalising my Cumbrian accent in the Lovely Lake District. I try to spend most of my time in the outdoor world with my wee family, my good friends new & old and also in my own company (which is great). But when I’m not out there with you all I take pride in serving my community of Inverness as a volunteer firefighter in the Scottish Fire & Rescue Service. Since I was a young lakeland lad helping out on farms during busy seasons I’ve always spent time wondering the natural places of the valley bottoms and mountain tops, in my late teens I began the journey of working in those environments as a guide and activity specialist. 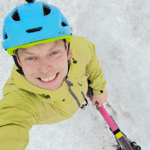 I now hold a varied mix of professional adventure activity tickets and have worked throughout the UK in Europe and in the US for many reputable providers. Biggest or bestest? Always the best adventures are those spent with the ones you love right? Taking my wee girl to the remote beaches of the west coast and spending happy nights in bothy’s are memories that will last forever and hopefully inspire respect for our world in her! Biggest would have to be spending a great deal of time working and playing in the Adirondacks (New York State), wow its beautiful there and so much to do!